Is Big Tech's Latest Bull Run Built To Last? Many large-cap tech stocks, especially the FANG stocks, are back at all-time highs after a lull earlier this year. Just how sustainable are the gains, though? Tech continues to lead the market up, but that might not be the case forever. 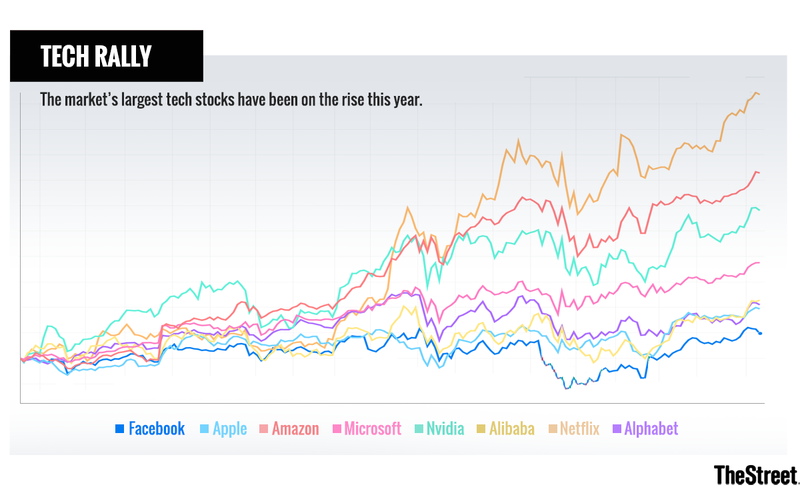 The tech giants, especially the FANG stocks, have been on the rise lately after a short respite in March and April, with shares of Apple Inc., (AAPL - Get Report) Amazon.com Inc., (AMZN - Get Report) Netflix Inc., (NFLX - Get Report) Nvidia Corporation (NVDA - Get Report) and Microsoft Corporation (MSFT - Get Report) all hitting all-time highs on Tuesday. While there's no denying that these stocks are good for the market right now, experts say investors shouldn't think they're invincible. S&P 500 Dow Jones Indices senior index analyst Howard Silverblatt said that many of these tech giants are the largest contributors to the market's gains so far this year. "The market would be in the red without them," Silverblatt said. For now, he said the outlook for these companies is still sunny, as the companies have the earnings and cash to support their stock prices. But that doesn't mean that things will stay this way. "There's always worry," Silverblatt said, citing concerns about trade wars and company-specific challenges such as Apple's $1,000 iPhone X sales and Facebook's (FB - Get Report) data security crisis. John Koudounis, CEO of Calamos Investments, told TheStreet that investors can't count on FANG stocks leading the market forever. "How long do you bet on that horse before [interest] rates catch up and scare" stock investors, Koudounis said. He added that "[the FANG stocks] are the very thing that caused this market to go up ... that's one of the things we have to be cautious about on the way down." FANG stocks were dipping slightly Wednesday, with Apple stock down 0.3% to $192.73 Wednesday, having increased 14% since the beginning of this year. Facebook stock was down 1.4% to $190.19 and has risen 7.8% so far this year. Alphabet shares were down 0.8% to $1,142.12 and have risen 8.4% this year, while Amazon shares were trading flat at $1,695.14 and have risen 45%. Netflix stock was down 0.3% to $364.78, and have gained 90% year-to-date. Facebook, Apple, Amazon, Alphabet, Nvidia and Microsoft are holdings in Jim Cramer's Action Alerts PLUS Charitable Trust Portfolio. Want to be alerted before Cramer buys or sells FB, AAPL, AMZN, GOOGL, NVDA or MSFT? Learn more now.